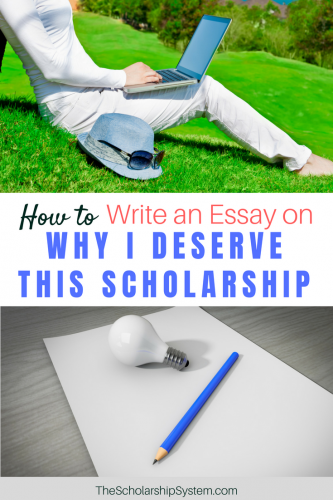 While there are a lot of potential topics a committee may want a student to cover in their scholarship essay, the “why I deserve this scholarship” prompt is one of the most common ones around. Ultimately, it seems simple at its core, but the “why I deserve this scholarship” topic can feel like the most complex question on the planet if your child isn’t sure how to tackle it. Ideally, your student needs to strike a balance in their tone, making sure they don’t come off arrogant while also not selling themselves short. Additionally, they need to cater their response to their target audience, the scholarship committee. If your child isn’t sure how to begin, here are some tips for writing a winning “why I deserve this scholarship” essay. It isn’t uncommon for students to struggle with the “why I deserve this scholarship” prompt because of self-doubt. Not everyone is comfortable tooting their own horn, and some even have trouble viewing their accomplishments as noteworthy, their experiences as valuable, and their perspective as unique. However, nearly every student has overcome an obstacle over the course of their life or had to persevere to reach a point of success. That means they do have something to share that can showcase why they deserve the scholarship. Before your child begins writing their “why I deserve this scholarship” essay, they need to have the right mindset. It’s important for them to realize that they are worthy and to use that feeling to drive their writing. If your student needs a little help, consider sitting down with them and reflecting on their biggest achievements. Remember, the accomplishments don’t have to be academic. Life experiences of all kinds can qualify, so don’t be afraid to mention events that happened outside of the classroom. When your child writes a scholarship essay, the scholarship committee is their target audience. After all, these are the people who select the winner, so catering the content to them can help your student force a stronger, more meaningful connection with the committee members. As your child gets ready to brainstorm ideas, they need to keep the organization behind the scholarship in mind. This allows them to choose the accomplishments that will genuinely speak to the reader. For example, a scholarship from a charity that focuses on giving back to the local community may appreciate hearing about your student’s volunteer experiences. A for-profit company might connect with your child’s story about running a side business or how they worked part-time while maintaining a high GPA. Organizations that focus on academics could connect with your student’s work as a tutor or time spent participating in school clubs that enhanced their learning experience. By focusing on the scholarship provider, your child can select accomplishments that align with the organization’s values and goals. If they aren’t sure how to find this information, the organization’s “About Us” page on their website can provide powerful insights, especially in their mission and core values statements. Ultimately, taking a little time to research the organization before your child writes their “why I deserve this scholarship” essay can pay off big if it gives them the ability to forge a more meaningful connection with their audience. Scholarship committees often get inundated with scholarship essays with statements like, “I’m a hard worker,” and other generalizations or platitudes. Sentences like that aren’t particularly powerful and aren’t almost guaranteed not to be convincing. However, a well thought out example has the potential to sway hearts and minds. In the vast majority of cases, people enjoy stories, so your student should tell theirs in their “why I deserve this scholarship” essay. Encourage them to take people on a journey instead of using clichés. It will be significantly more impactful, and can dramatically improve their odds of being selected. Scholarship committees don’t just want to know where your student has come from; they also want to know where they are going. Along with discussing their accomplishments, your child should also include details about their goals and how the scholarship can help them reach them. To create an effective scholarship essay, your child will need to look beyond simply getting their degree. For example, do they have a career in mind? Do they want to change the world in some way? Is there something they are hoping to achieve outside of academia? Once your student has an idea of where they want to go, they need to explain how the scholarship can enable them to get there. For example, giving them the ability to attend a school with a rigorous and respected program in a relevant field that would otherwise be unaffordable could be a pertinent point. Similarly, if the scholarship allows them to access additional experience that would help them excel, such as a chance to participate in a non-paid internship instead of working a part-time job, that could also be worth discussing. The idea is to showcase that, by awarding your child this scholarship, more people could benefit than just your student. In the end, a scholarship is an investment made by an organization, so they want to know that it is money well spent. If your child wants to impress the scholarship committee, they need to make sure they use the proper structure when writing their essay, no matter what topic is being covered. Generally, this involves starting with an introduction (also known as a thesis) that both catches the reader’s attention and summarizes what is going to be discussed. Then, they transition into the body of the essay, where each paragraph will cover a single point or a relevant example that addresses the topic. Finally, they again summarize the essay, reemphasize how their points support the topic, and discuss lessons learned to create a solid conclusion. If your student isn’t comfortable with creating the structure for their “why I deserve this scholarship” essay, have them check out this article: How to Write a Winning Essay. It covers the basics of everything from brainstorming to editing the final piece, providing them solid guidance to help them craft a great essay for any question they may encounter. Ultimately, writing an amazing “why I deserve this scholarship” essay doesn’t have to be challenging. Your child just needs to consider their accomplishments, cater the achievements they cover to the audience, speak about the future and how the scholarship will help, and bundle it all together using the proper structure. With a little self-reflection, your student can certainly come up with something that sets them apart and highlights why they are such an amazing investment. And, if they have trouble, offer to sit down with them and reminisce about everything they’ve been through and achieved. Everyone has something that makes them a great scholarship recipient, so bolster your student’s confidence and let them showcase their awesomeness for all the world (or, at least the scholarship committee) to see. How far would you go experimenting with love-making? !